What's the buzz at the Bee's Knees? : Let's Talk About Pudding! 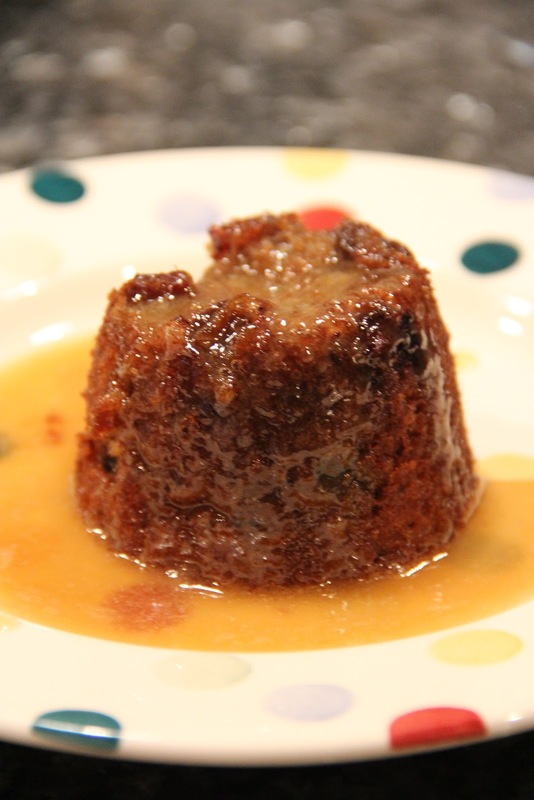 On Saturday night we had some friends over for dinner and I decided to make Delia Smith’s wickedly delicious sticky toffee pudding for dessert – or would that be for pudding? As we were tucking into the cute, little cakes topped with a decadent toffee topping, our friends, between their oohs and ahhs, wanted to know about the recipe. This conversation ultimately led to some confusion from the Americans as to how these cake-like creations could be called pudding. So ensued a fun discussion about pudding! We did agree that when most Americans think of pudding they think Jell-O! Or some kind of sweet, mousse-like, custard dessert. 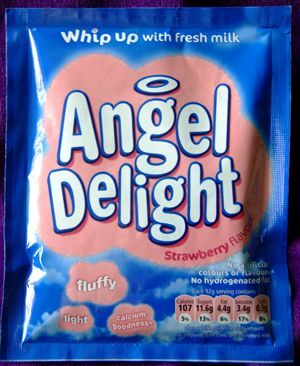 Growing up in England we knew this as Angel Delight, which came as powder in a packet that you whisked with milk to get your “afters”. We never called the actual creation pudding, but it was pudding because it came after the main course. Generally in England, anything sweet that comes after the main course is called pudding, not dessert. Pie can be pudding, so can flan, meringue . . . Although in a fancy restaurant you will probably be offered the “dessert menu”! I thought I would look through my fairly large selection of cookbooks (I love to cook) to see what they said. In my Good Housekeeping Great American Classic Cookbook, which I received as a gift when we became American citizens, they have a chapter called “What’s for Dessert Tonight?” They do have Christmas pudding and rice pudding in there. But in my battered copy of the classic Delia Smith’s Complete Illustrated Cookery Course she has a chapter called Fruits & Puddings with all kind of sweet recipes for after dinner. Also, in Jamie Oliver’s newer Ministry of Food you will find all the dessert recipes under “puddings” in the index. But to confuse things, there are puddings that are puddings! Dessert items that are also a pudding like the sticky toffee puddings. In this case we Brits are generally referring to a steamed, sponge pudding. A sponge cake like recipe that is put in a pudding basin and covered with parchment paper and steamed over a pot of boiling water. Sound strange? Really they are delicious! Of course, Christmas pudding is the most famous and you will find these recipes in American cookbooks too. The Good Housekeeping book calls it figgy pudding. We do only eat this heavy fruit and brandy-laden pud on Christmas day. The pudding is usually placed on a plate, more brandy is poured over and this is then lit with a match for a nice fiery celebration. 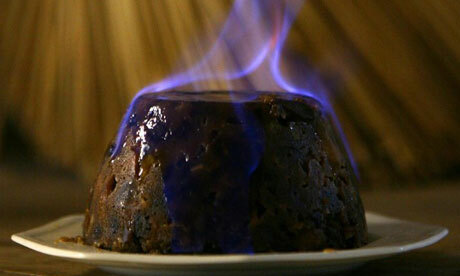 When the flames subside, the pudding is sliced and served with dollops of brandy sauce on top! As a child, my mum would also make a steamed syrup sponge. When the sponge was turned out of the bowl onto a plate, the hot syrup would pour down the sides of the pudding like volcano lava. Top that with hot custard and you have a delicious traditional British dessert. Mum would also make a steam chocolate sponge with chocolate custard. And let’s not forget Yorkshire puddings – but that’s a whole other blog entry! Hopefully this can help clear up some of the confusion about pudding. What’s your favorite pudding . . . or dessert? Visit www.thebeeskneesbritishimports.com to see our lovely range of British-made homewares. I love a good steamed pudding with custard sauce, though most times I prefer the custard cold, but sometimes hot. I'll be posting my custard sauce recipe on Friday morning, in fact. I will certainly look for that recipe. The weather here in Massachusetts this week is perfect for pudding and custard! Hope the sun will return soon.